Hi Ladies! Last night I was thinking about all the things I want but just can't afford to buy at the minute. As sad as this makes me, it gave me an idea for a new post. I have seen people doing 'weekly wishlists' on their blogs so I thought I would create one of my own. I have picked ten things that I've been lusting after and I thought I'd give a quick summary of why I need to get my mitts on each of these things. 1. Michael Kors Rose Gold Watch - This has been on my wish list for ages now and I'm pretty sure it will stay there until I somehow rustle up the money to buy it. These watches are a bit of a beauty bloggers fave and for me, I'm no exception. I especially love this rose gold one I have picked out, I think it looks cool yet classy at the same time. For all you lucky ladies who already own one of these - I am utterly jealous! I wish santa would hurry up so I can write him my list ;). 2. YSL Rouge Volupte Lipstick - Again, I have been lusting after one of these lipsticks for quite some time now. 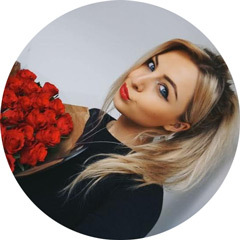 Another beauty bloggers fave and I can 100% see why. Just look at that beautiful, intricate gold packaging? Isn't it just to die for? I recently swatched these lipsticks in Brisbane and instantly fell in love. Creamy, pigmented and amazingly beautiful to look at. What more could a girl want? 3. NARS Duo Eyeshadow - Since receiving the 'Isolde' duo for my birthday, I have decided I need more of these in my life. They are some of the most pigmented eyeshadows I have ever used and so handy for travelling. They have a massive range of shades and I have been eyeing up 'Kalahari' in particular. 4. Studded Shoes - Yes, that's right. Studded shoes. It doesn't matter where they come from, I just need a pair. I absolutely love the whole studded trend whether its jewellery, shirts or shoes. These particular ones are from Topshop for reference and I love them. I think they are perfect to wear with skinny jeans or leggings and instantly spruce up an otherwise boring outfit. I may have to treat myself to these even though I'm currently poor. I'll just have to class them as a Autumn/Winter essential. Hmmmmm. 5. Topshop Blazer -Every time I go on the Topshop website, this jumps out at me. I don't know why I do it to myself, it's torture. Theres nothing worse than knowing you would get so much wear out of something but still not being able to justify spending money. I'm not much of a jacket wearer so most of the time you will find me in blazers, whatever the weather. I live in my black blazer and feel like I need a new colour to mix things up a bit. I love this beige one as it will go with almost every piece of clothing I own. I also love that blazers can instantly spruce up a plain outfit. Someone buy it for me? Pleaseeeee 8). 6. NARS Sheer Glow Foundation - I have heard great things about this foundation and as a huge NARS fan, I'd love to try this. The name Sheer Glow really appears to me as I love nothing more than glowy, dewy skin. Has anyone ever tried this? 7. Miss Dior Cherie Perfume - After having a few sniffs of this, I am in love. It has such a beautiful sweet girly scent and the bottle is so gorgeous and girly. It will definitely be my next perfume purchase. 8. Inglot Eyeshadows - A few months ago I bought the 10 pan freedom eyeshadow palette from Inglot. At the time I bought three eyeshadows and I absolutely love them. They are creamy, pigmented and best of all, cheap. I would love to get my hands on another seven shades to fill my palette but until I have money, they will have to remain on my wish list. *sobs*. 9. Origins Gin Zing Eye Cream - Again, this is a fairly hyped product on the beauty blogging scene and all the good reviews have got me longing to try it out for myself. I really like the idea of a brightening eye cream as I often find my eyes look quite dull and tired in the mornings. Have you tried this product? Does it live up to the hype? 10. MAC Heavenly Creatures Collection - I recently swatched the new Heavenly creatures collection and everything was so gorgeous. I love the Mineralize products from MAC so this is my ideal collection. I particularly loved the Mineralize Skinfinishes, blushes and eyeshadows. So basically everything then? Yeah. Why are you so expensive MAC? Boo! Do you own any of the things on my wish list? Which products are you lusting after at the moment? My aim by the end of the year is to own a Michael Kors watch...love them so much. Ahh my friend bought a rose gold MK watch when we went to Vegas, I settled for a purse, but like you, I NEED a MK watch. Haha i love this post! 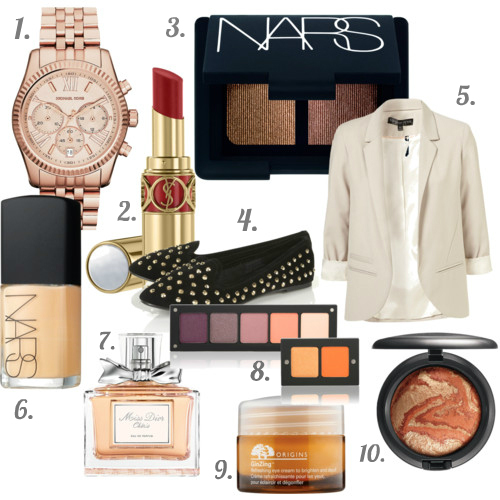 theres soooo many things i wish i could buy - but cant afford just yet :( especially the nars sheer glow! I agree with everything on this wishlist! Especially the Michael Kors watch! LOVE the Dior perfume. I'm not usually into really floral scents, but this one is gorgeous. i have the Origins eye cream :) It's seriously amazing, you will not regret buying it! Really want to try the origins eye cream! Heard so much about it! Love the Michael Kors watch, I have a Marc Jacobs Rose Gold watch and I adore it!!! Great post lovely :) I really have to stop myself from spending, so I am making a wishlist as well. I really want to get the new Benefit corrector I think it's called "Perk Up Artist". the watch and the blazer! please?! i love these two. i've wanted the watch for months too. i really need to start saving. I sooo want a NARS shadow duo - their makeup feels so nice when applied, light n' fresh which I love! Great post! I too would like mamy of these things lol. I already have Miss Dior Cherie Perfume and I'm not the biggest fan anymore. At first it's this fun sweet smell, but once I started wearing it more I noticed it was a sickly sweet scent. Love this wishlist! The rose gold watch is gorg (love rose gold!) and that blazer... I want it too!